It seems like everyone – people and companies – is moving from The Golden State and making North Texas their home. Sure California knows how to party, but folks are realizing the future, and the economy, is bright deep in the heart of Texas. That’s pretty much the story behind one of Dallas’ newest restaurants – Laurel Tavern. The restaurant group behind the concept came to town for the a social visit, and they decided to stay. I don’t blame them. 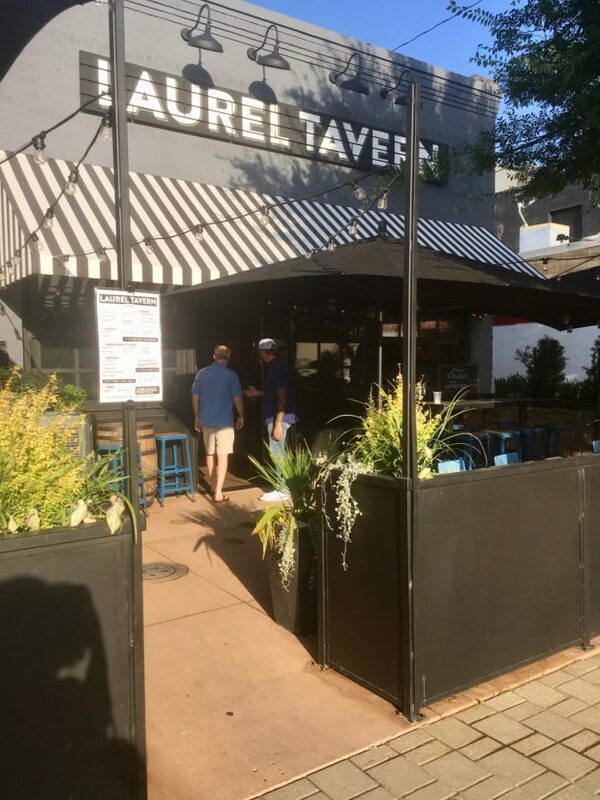 Laurel Tavern is a casual but elevated modern American bar and restaurant on the southern and ever evolving end of Greenville Avenue. 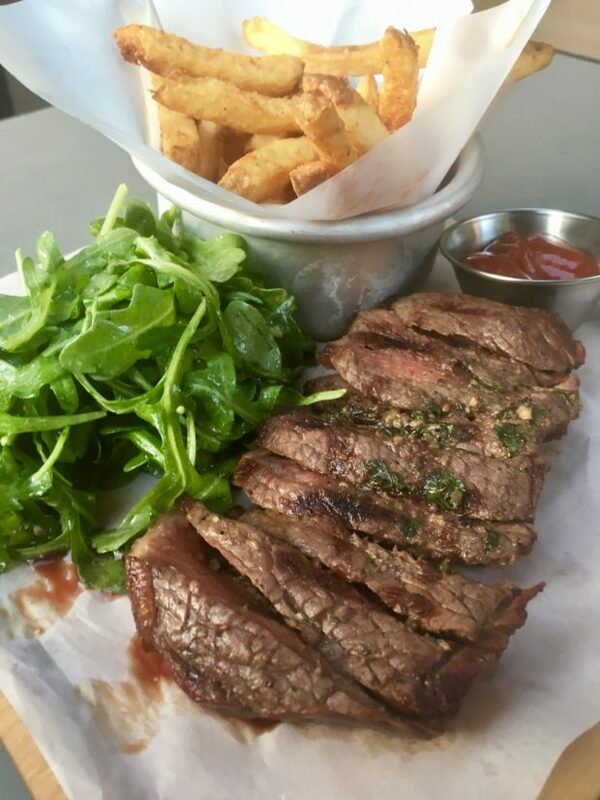 It has an intentional focus on high quality but approachable food, cocktails and superior hospitality – or as the manager simply put it “it’s a bar with really good food.” You won’t find bad nachos or dry burgers here. We had a chance to visit shortly after they opened for a lovely date night. It was a HOT Friday evening so cocktails were required upon arrival. I selected the Lost in Translation and my dining companion J of course opted for an Old Fashioned. My beverage was refreshing and not too sugary, and I loved the hint of savory warmth from the rosemary branch. Both cocktails prepared our palates nicely for the meal ahead. As we sipped on our drinks, we took a gander at the menu to select our appetizers. No matter where we go, if pork belly is availalbe, my husband wants to try it. So we decided to give that a whirl along with the fish tacos, which I’m sure surprises no one. 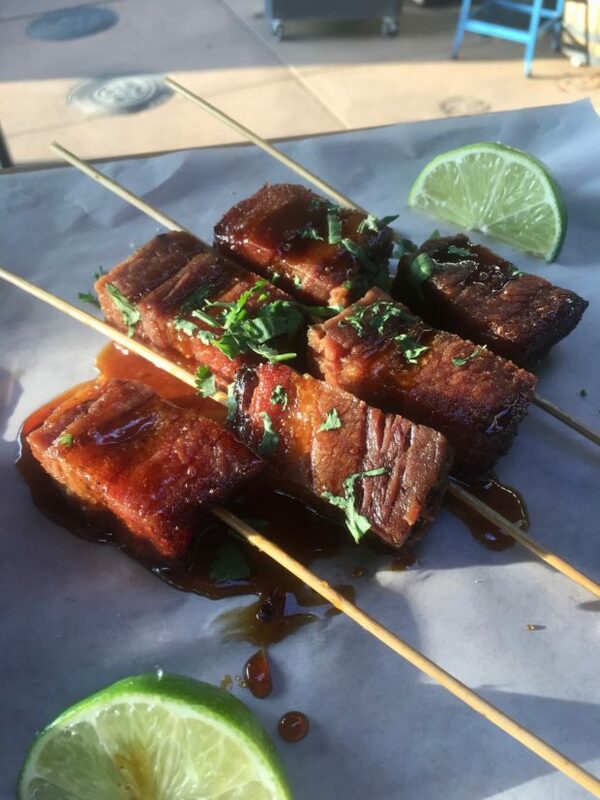 The pork belly skewers were drizzled with maple glaze and were the perfect bite – crispy on the outside and tender and moist on the inside. 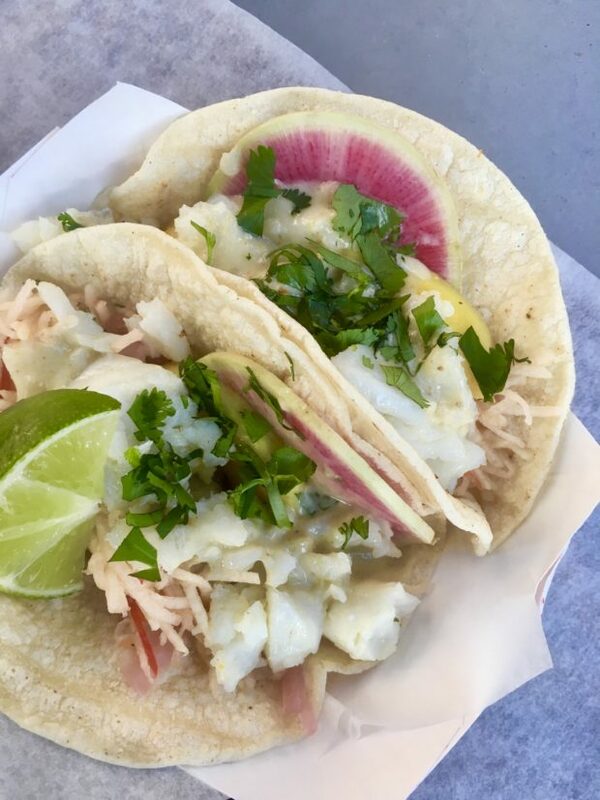 The fish tacos were topped with a papaya slaw, coconut curry, fresh mango and a pickled red onion. I am a fan of anything sandwiched in between a warm tortilla, and I’m always amazed by the unique flavor combinations that chefs are creating. Moving along to the main entrees, we ordered the Steak & Fries and the Crispy Chicken Salad. The manager said they had to put a steak on their menu because people really seem to like their beef in Texas. Right you are sir, right you are. 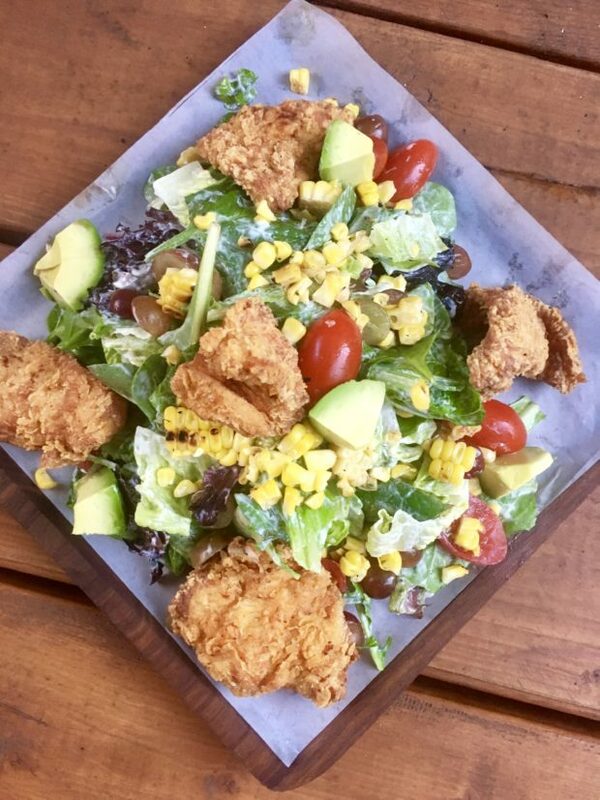 The salad was topped with big nuggets of chicken breast and tons of fresh veggies full of texture and color – my perfect meal: healthy with a little bit of naughty. Everyone kept looking over and asking what I was eating. Now there’s one thing I have to give you a heads up on…..I mentioned at the beginning that they call this place a bar with really good food, which a lot of places say these days. 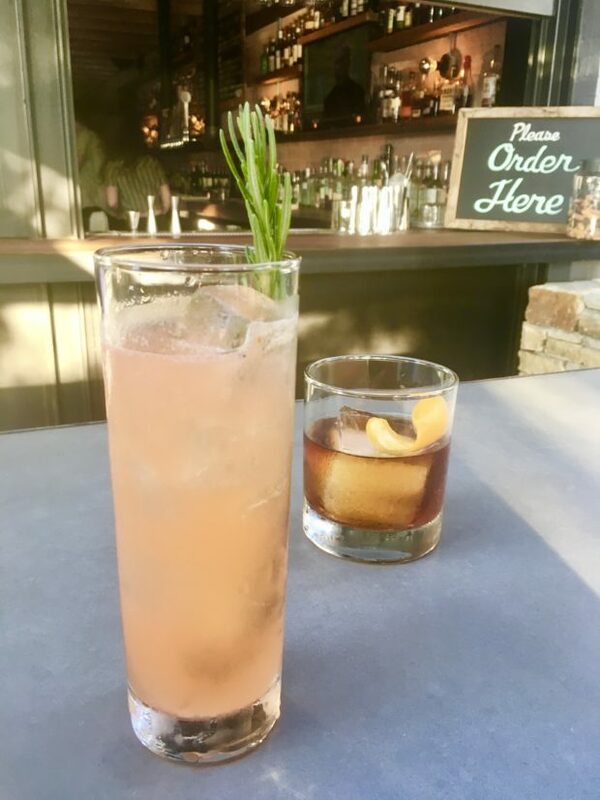 What’s different about Laurel Tavern is that like a bar, diners order everything at the bar – drinks and food – and then someone brings your items to you at your table. To be perfectly honest, that is probably my least favorite part of any “bar” experience. I didn’t like it when I was 22, and I’m not a fan at 32. Yes, our order was delivered in a timely fashion and the service was attentive, but I sure wish we could skip that part altogether. I love when places like Laurel Tavern open. It’s an elevated, but accessible dining experience that is approachable to everyone. You don’t have to worry about an exorbitantly-priced menu, small entree portions or worse a pretentious atmosphere that makes you want to throw up the previously mentioned over-priced food. Maybe it was our low cost of living and warm southern hospitality that brought them to Dallas, but I think their top notch menu will make them a staple and a regular spot for Dallasites looking for a good time.